Here at ChiIL Live Shows, we've enjoyed Ionesco's quirky take on life since we first encountered his works in college in the late 80's. After studying Rhinoceros, I could never quite look at theatre the same way again. So many of Ionesco's quotes are brilliant. 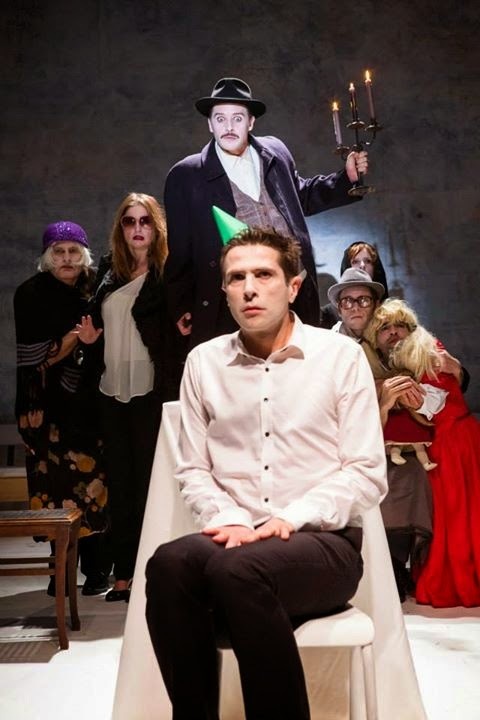 Whether you are a newbie to his works or a long time admirer, come see Ionesco Suite by THÉÂTRE DE LA VILLE in French with fabulous accents and English subtitles! Check it out. Chicago Shakespeare Theater (CST) continues the dynamic World’s Stage Series with the U.S. debut of Théâtre de la Ville’s Ionesco Suite from Paris, France. Directed by Emmanuel Demarcy-Mota, this absurdist masterpiece celebrates the work of maverick avant-garde playwright Eugène Ionesco with a whirlwind montage encapsulating seven of his plays, brimming with wicked humor and hard-hitting themes. 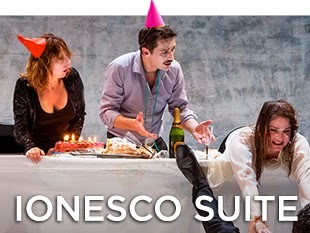 In its only United States engagement, Ionesco Suite will be performed in the theater Upstairs at Chicago Shakespeare, October 15–October 19, 2014. The cast of Théâtre de la Ville’s IONESCO SUITE, a World’s Stage presentation from Paris. Left to right: Jauris Casanova, Céline Carrère, Stéphane Krähenbühl, Sandra Faure, Olivier Le Borgne, and Charles Roger Bour. Photo by Agathe Pouoponey. Stéphane Krähenbühl and Gérard Maillet in Théâtre de la Ville’s IONESCO SUITE, a World’s Stage presentation from Paris. Photo by Agathe Pouoponey. Conceived and directed by celebrated Théâtre de la Ville Artistic Director Emmanuel Demarcy-Mota, the scene for Ionesco Suite is set in a seemingly ordinary dinner party attended by five characters. The gathering descends into an absurdist nightmare, making for a lively rampage against social conventions and a scathing parody of human behavior. 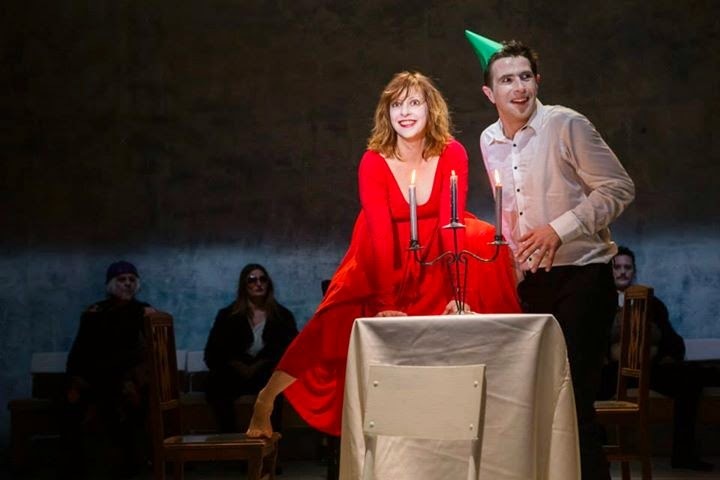 Sandra Faure and Jauris Casanova in Théâtre de la Ville’s IONESCO SUITE, a World’s Stage presentation from Paris. Photo by Agathe Pouoponey. French-Romanian dramatist Eugène Ionesco pioneered the Theater of the Absurd along with such visionaries as Samuel Beckett, Tom Stoppard and Harold Pinter, creating works that challenged notions of life’s meaning and order. The piece combines excerpts from seven of the avant-garde playwright’s wildly innovative plays—from the well-known The Bald Soprano and The Lesson to the more rarely performed Jack, or The Submission and Two for Delirium. 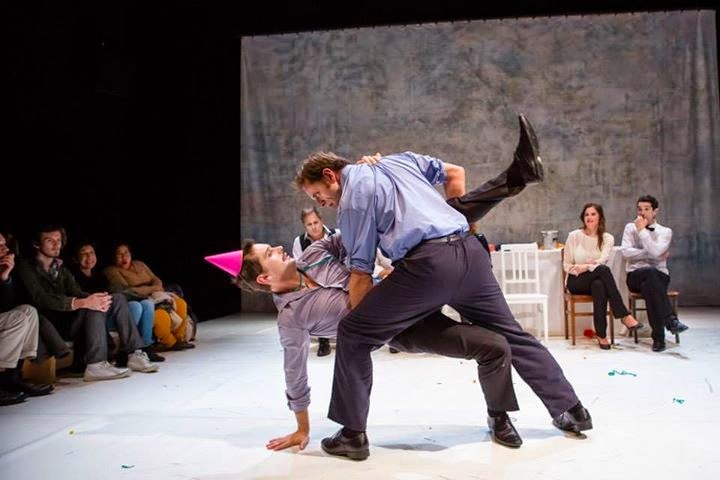 When Director Emmanuel Demarcy-Mota staged Ionesco’s Rhinoceros ten years ago, he developed a fascination for the playwright’s humor and his obsessions with cohabitation and solitude—inspiring him to create Ionesco Suite so that contemporary audiences could discover the work anew. The illustrious Théâtre de la Ville produces over 100 different shows annually across the vast spectrum of genres, including theater and performance art, contemporary dance, and classical and world music. 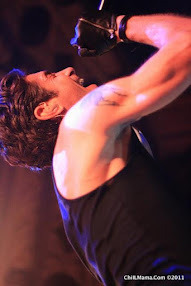 They have developed new audiences at home and abroad, forming partnerships with theaters in Germany, Spain, Netherlands, Greece, England and the United States. In January, CST hosts two contributions to the Chicago International Puppet Theater Festival (January 14–25, 2015): The Table from the UK’s Blind Summit and FREEZE! from Belgium-based artist Nick Steur. CST presents the Royal Shakespeare Theatre and National Theatre of Scotland collaboration, Dunsinane, which imagines the aftermath of Shakespeare’s Macbeth (February 26–March 22, 2015). The season began with the Shakespeare’s Globe production of Hamlet from London and an inventive Australian walkabout theatrical journey, Since I Suppose. Over the past decade, CST has imported more than 700 international artists to Chicago. Jauris Casanova (center) surrounded by the cast of Théâtre de la Ville’s IONESCO SUITE, a World’s Stage presentation from Paris, which will be presented in the theater Upstairs at Chicago Shakespeare, October 15–19, 2014. Back left to right: Charles Roger Bour, Céline Carrère, Stéphane Krähenbühl, Sandra Faure, Gérard Maillet, and Olivier Le Borgne. Photo by Agathe Pouoponey. 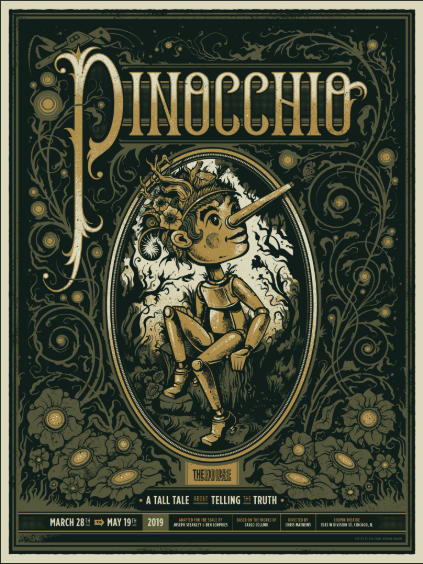 Ionesco Suite will be presented October 15–19 in the theater Upstairs at Chicago Shakespeare. Chicago Shakespeare Theater’s presentation of Ionesco Suite is performed in French with projected English translation. Tickets are on sale now for $45–$55 with special discounts available for groups of 10 or more, as well as CST for $20 tickets available for patrons under 35. All patrons receive a 40% discount on guaranteed parking in Navy Pier garages. 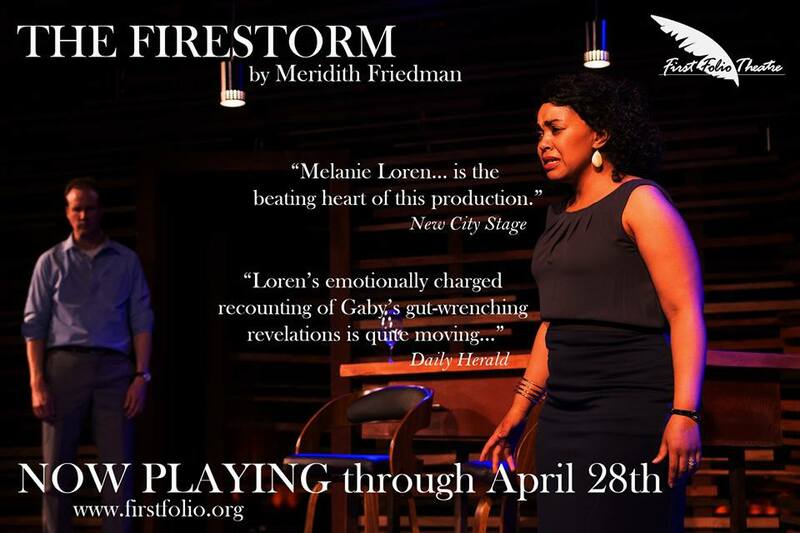 For more information or to purchase tickets or a season subscription, contact Chicago Shakespeare Theater’s Box Office at 312.595.5600 or visit the Theater’s website at www.chicagoshakes.com. Chicago Shakespeare Theater (CST) is a leading international theater company and the recipient of the Regional Theatre Tony Award. Under the leadership of Artistic Director Barbara Gaines and Executive Director Criss Henderson, CST is dedicated to producing extraordinary production of classics, new works and family fare; to unlocking Shakespeare’s work for educators and students; and to serving as Chicago’s cultural ambassador through its World’s Stage Series. Through a year-round season encompassing more than 600 performances, CST attracts 200,000 audience members annually. One in four of its audience members is under eighteen years old, and today its education programs have impacted the learning of over one million students. CST is proud to take an active role in empowering the next generation of literate, engaged cultural champions and creative minds. Visit www.chicagoshakes.com.